Astronomy is one of those subjects that is an absolute joy to teach. There are so many resources out there, however, that it can sometimes be overwhelming to figure out where to start. And this is also one of those subjects that you should definitely add some hands-on activities for if you want your kids to fully appreciate what they’re learning. 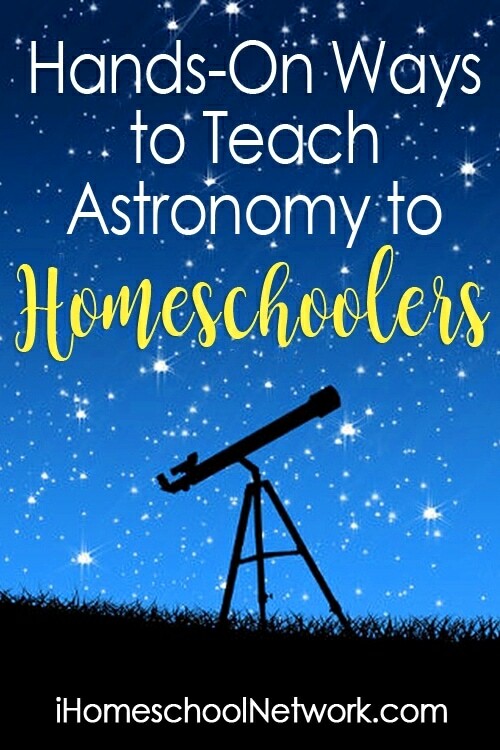 So, if you’re considering teaching your kids about astronomy this spring, how do you sort through the masses of options available and get started? First, it’s extremely important that you decide whether you want to teach this subject from a secular or a Christian worldview. This decision will have a huge impact on the resources that you choose. If you want to stick with a secular worldview, you can find lots of books, movies, and textbooks from which to teach your kids. Resources from NASA, and PBS are great places to start. If you want to teach the subject from a Christian worldview, you need to be a bit more selective. Resources from Apologia and Answers in Genesis would be good places to start. These companies try to show both the secular viewpoints as well as the Christian viewpoints so that kids will be able to defend their position when discussing astronomy with others. Weather – You want to have a dark sky so that more objects will be visible. This means that you should choose a night that is clear and cloudless. Also, you will be outside for many of these activities so try to choose a night which isn’t quite as cold or you might have a hard time keeping your kids from wanting to scurry back inside. Location – Again, a dark sky is key so the farther away you can get from city lights or street lights the better. Tools – It’s nice to have a set of binoculars or a telescope when viewing objects in the sky. Guides – Field guides are extremely helpful so that you will know what objects are visible and where to look depending on the date and your location. Family Star Gazing – Take a blanket and go outside to view the stars, planets, the moon, meteors, etc. Go to Planetarium – This activity can be enjoyed at any time of the year and unlike many astronomy activities, it isn’t weather dependent. Be aware that most planetariums will present their programs from a secular viewpoint. However, our family has deeply enjoyed the Christian worldview planetarium shows at The Creation Museum. And there are other planetariums which also present information from this viewpoint as well. Do your research so you’re prepared for what you will encounter. Go to Local Observatory – Many communities have observatories which house larger telescopes which are open to the public at various times. These observatories often have daytime tours as well as times when families can come and view various objects in the night sky. Attend a Star Party – Many communities also have local astronomy clubs which hold star parties where personal telescopes are used to view the night sky. Some of these are also open to the public. Make a model– Build a rocket, space station, or satellite using LEGO bricks or K’nex. You can also purchase model kits that your child can assemble. Model Rocket Launch – Our family likes to host a rocket launch each spring. My boys invite their friends to participate and each child launches their rockets several times to see how high they can go and still be able to retrieve them. Make a Comet – If you’re looking for an exciting science experiment, try making a comet. Super fun activity which will help your kids to understand what comets really are as they go streaking across the night sky. Take a Space Quiz – Ask your kids these questions and see how many they get right. To make it super fun, try incorporating buzzers or candy as prizes for correct answers. Playing with Planets – Playground Park Bench has a cute hands-on activity for preschoolers to become more familiar with the planets. Moon Crater Gross Motor – Pre-K Pages has a fun hands-on activity for preschoolers to learn more about the moon. Where you live and the time of year are key when it comes to which objects will be visible in the night sky. The moon is always an interesting thing to observe because it can be appreciated by the naked eye. No fancy equipment is needed to enjoy watching the moon. The best times to observe the moon are when it is full or nearly full. If you live in the northern hemisphere, the best constellations to look for in the spring are the Big Dipper, the Little Dipper, Orion, and Leo. If you live in the southern hemisphere, there are completely different constellations to look for. Locate a star map for your location and the time of year so that you’ll know in which area of the night sky you should be looking. Here are some great books to read when teaching our younger kids about astronomy. There are also many apps such a Skyview, Star Walk, and Simple Rockets that you should be sure to check out! 2017 is a special year as we are about to experience a total solar eclipse. We haven’t had a total solar eclipse in the US in almost 40 years. But even more rare is the fact that this eclipse will be able to be seen from coast to coast. The last time that happened was 99 years ago! You’ll want to check that out for sure! As you can see, there are lots of hands-on ways to teach astronomy in the spring. Decide which activities will be the most appreciated by your children and add a few of them to your homeschool schedule. Astronomy is one of those topics that can be appreciated by everyone to at least some degree. We live in an amazingly complex and vast universe, one that is incredibly fun to explore with our kids. Michelle has been married to her best friend for almost 20 years. She is also a homeschool mom to her two wonderful (and tall) sons. Michelle is a Christian, a fan of simple living, and a lover of chocolate. She loves her spicy chai tea in the morning and she has a hard time staying out of the snacks at night. You can find her blogging at www.homeschool-your-boys.com. Her mission is to encourage and inspire parents as they homeschool their boys.